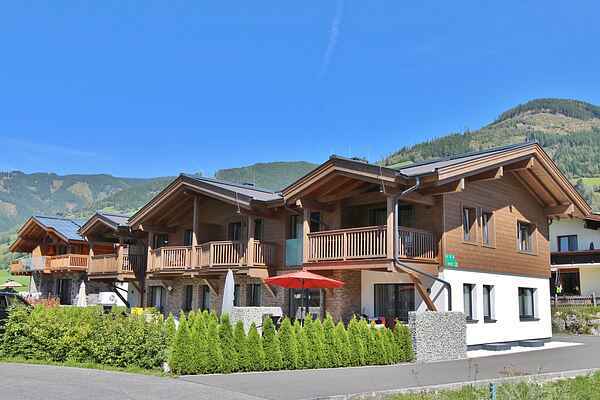 With a view over the gorgeous mountains of the Hohe Tauern National Park, sun-drenched and just a few minutes by car from the famous Kaprun and Zell am See, you'll find this beautiful apartment complex built in a typically warm Austrian style. There is a spacious apartment of 92 sqm on the first floor, which consists of a large living room, an open-plan kitchen and no less than three bedrooms and two bathrooms. In addition, you'll have a beautiful balcony with a fantastic view. Plenty of luxury. The high-end decoration and warm furnishing will make you feel right at home. After a day enjoying the snow, a nice hike or a mountainbike ride, you can relax in the communal wellness zone with sauna. In short, a wonderful apartment which is really worth its four stars. The location of this complex is perfect: sunny, nearby Zell am See and Kaprun, centrally located in the Salzburgerland, and the ski slopes in Zell am See are just three stops away by ski train, which is free. In the summer, the outdoor pool is right next to your door.